Wow, what a weekend! 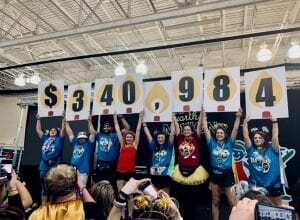 This past weekend we got to see miracles being made at Georgia Tech and Kennesaw State University’s Dance Marathon. The two schools competed against each other during one hour of the event to see who could raise more money for Children’s Healthcare of Atlanta. Together they raised more than $34,000 in one hour. At the end of the two events, both schools announced their largest fundraising total yet. Georgia Tech raised $322,314.19 for the Sibley Heart Center at Children’s and Kennesaw State University announced a total of $340,984 for the Center for Advanced Pediatrics at Children’s. It is truly amazing to see these two student-led organizations rally behind our patients and families. We cannot thank them enough for their continued support and dedication to Children’s.